An option to make manual drilled tube wells is the so called SHIPO drill. Can be cheaper in soils where a well needs to be completely lined. 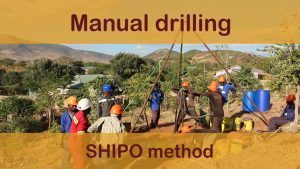 SHIPO drill method is used much in Tanzania and trained via, promoted by SHIPO. It is a combination of sludging and percussion and can be combined with Jetting.